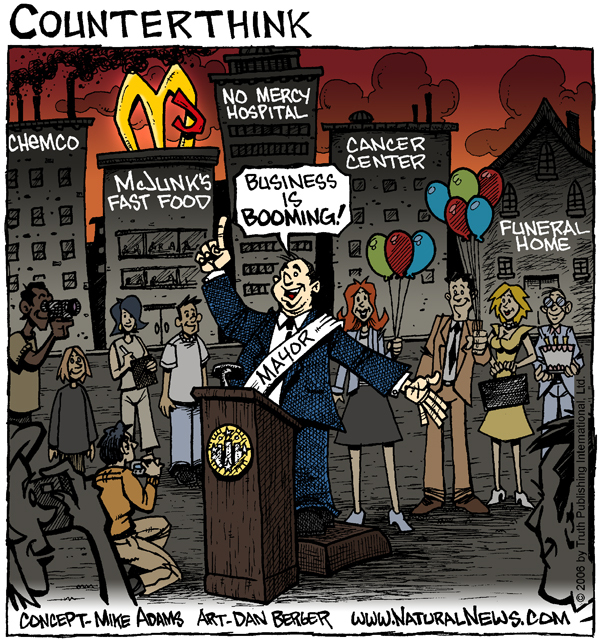 (NaturalNews) For decades, McDonald's has been the poster child of chemically-altered factory-made fast food. While preying on the emotional imprinting of children with on-site playgrounds and social engineering marketing tactics, the restaurant's true fundamental ethics are reflected in the horrors of the factory food industry: imprisoned chickens in tiny cages, genetically modified soy as meat fillers, chemically-altered menu ingredients and a geopolitical form of processed food imperialism that has resulted in McDonald's restaurants "occupying" hundreds of nations around the world while exporting obesity, diabetes and heart disease globally. Now, the global restaurant chain is feeling the financial vacuum that happens when people realize you've been feeding them poison. Corporate earnings are "in an absolute free fall", reports Quartz.com. "McDonald’s announced today that sales at stores open at least a year were down more 1.7% worldwide, and dropped 4% in the all important US market." A 4% plunge in the US market is almost unheard of in the fast food chain business. 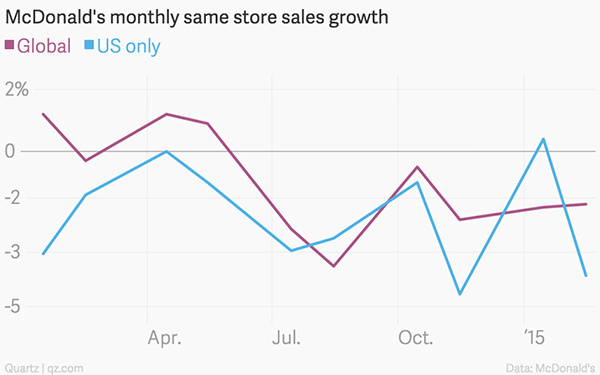 That kind of move away from McDonald's is not a correction, it's a stampede for the exits. And where are people going instead? To restaurants like Chipotle, which was once owned in large part by McDonald's but has since branched off and found a groove with more health-conscious customers who really do give a hoot where their food ingredients come from. Desperate to make up for lost ground, McDonald's has announced its intention to (kinda sorta) remove "human antibiotics" from its chicken meat supply. In a document entitled, McDonald’s Global Vision for Antimicrobial Stewardship in Food Animals," the company says it hopes to "[p]rohibit the use of antimicrobials in food animals that are by WHO definition 'critically important' to human medicine, and not presently approved for veterinary use." Huh? They're going to require the removal of antibiotics which are not presently approved for use in animals? So what are those chemicals doing in the food supply in the first place? If you've been eating Chicken McNuggets over the years -- and who wouldn't enjoy chicken parts that are pressure-formed into the exact same four cookie-cutter shapes? -- you've apparently been chomping away on human antibiotics which were never approved for use in animals in the first place. Even more worryingly, the document doesn't even say McDonald's is absolutely phasing out those antibiotics. One paragraph explains, in classic Dilbert speak, that McDonald's "...will work within each area of the world with stakeholders, including suppliers, industry partners, government agencies, NGOs, veterinary and university extension networks, and other retailers to gain alignment on expectations and developing timelines for implementation and verification criteria that would reduce the use of medically-important antimicrobials in food animals." McDonald's claims to be protecting animal welfare? Pathetically, that same document also insists that "Treating animals with care is integral to McDonald’s animal health and welfare program." Animal health and welfare program? Does it look like Guantanamo Bay for chickens and cows? I'd sure like to see some independent video of these facilities where McDonald's claims it is exercising its animal "health and welfare programs." I know what animal health and welfare really is. I recently saved the life of a chicken that had part of its hind quarter eaten by a dog. (See shocking photos here.) On my ranch in Texas, I treat animals with compassion and care, and because they are being raised in a healthy, free-range environment, they don't need any chemical antibiotics! Nada. 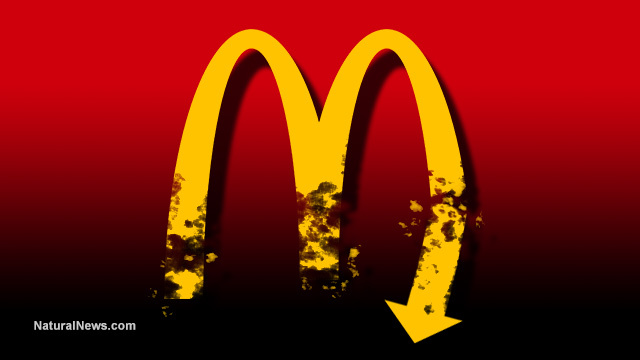 Truth be told, if McDonald's hopes to have any real future, it needs to seriously pursue food supply line transparency. • Where their food came from. • How the animals were raised. • How the food was processed. • What was added to it. • What was removed from it. • Whether there are any GMOs in it. • Whether it's contaminated with glyphosate or heavy metals. • What impact it might have on their health. Any fast food restaurant company that can't move in the right direction toward providing legitimate answers to these questions is going to lose market share. Because there are plenty of other options out there for people who are willing to pay a little more money in exchange for a little more transparency. Why do McDonald's mascots seem to resemble mass murderers and serial killers? Did McDonald's pay Kanye West to try to make toxic food cool?